I spent last weekend in Michigan at a Banjo convention. Now you may be thinking, “Hey I didn’t know you were a banjo fanatic!” Yeah, well the thing is I’m not. I am not the teeniest tiniest bit into banjos. However, my nine year old daughter, who all evidence points towards having been swapped at birth, is. She is banjo obsessed and has been for years. Banjo is her thing. My daughter, who has been asking me for banjo lessons since she turned three, has only actually been playing the banjo for about a year and a half now. 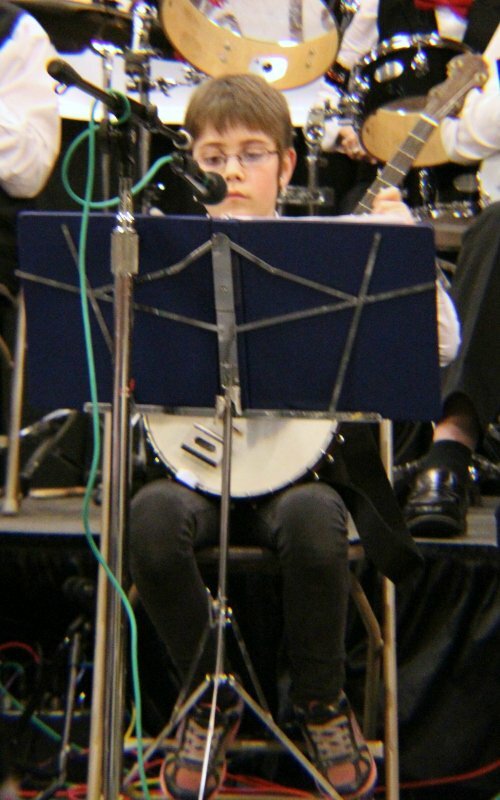 When she was eight she became a member of a local banjo club. We have been truly blessed that this group of musicians was willing to not only allow a young kid to attend their weekly meetings, but to take her in and help her to learn to play. Despite the fact that I try and drill it into her head, I often suspect she doesn’t fully realise just how darn lucky she is. Singing “You Are My Sunshine” with the Windsor Banjos. Let me be clear, it’s not like I have some little virtuoso on my hands here. She is starting to make some music, and she is doing okay for someone who has only really been taking lessons for five months, but she is no banjo prodigy. About five months back we finally found a “real” teacher that was willing to take her on as a student. She’s been flourishing under his weekly lessons. 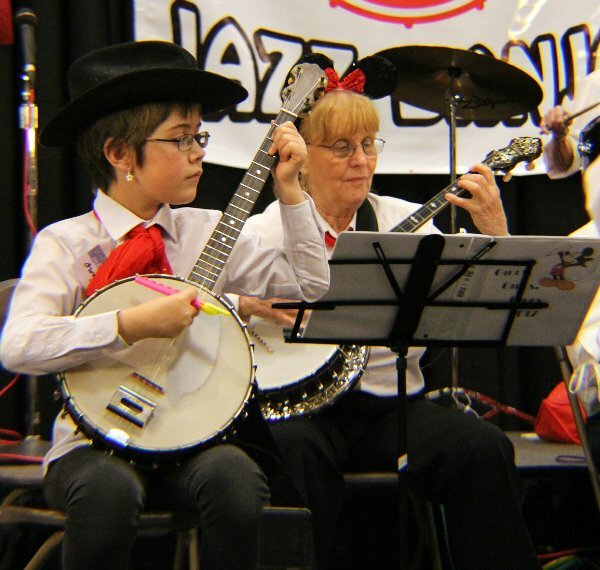 My mom takes her to her weekly banjo club meetings, and to her music lessons. Banjo is her “Mimi thing”. I think my daughter looks forward to sharing that one on one time with her grandmother as much as she does her time spent playing banjo. Swapping hats and being silly with the All Girls Band. 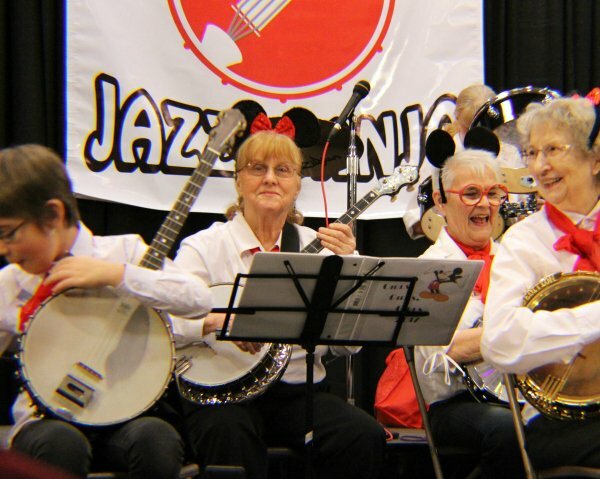 It was my mom who made all the arrangements for the two of them to attend this banjo conference. 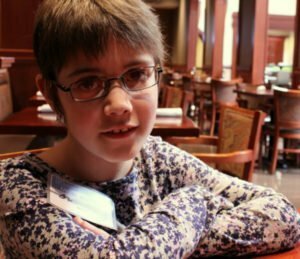 She registered my daughter as a musician, and she booked a hotel room for two nights. I offered to tag along, to swap off of on guardianship duties. My girl is only nine, and no matter how friendly and welcoming all these banjo folks have been, there is no way I was letting her wander around without a grown up with her. 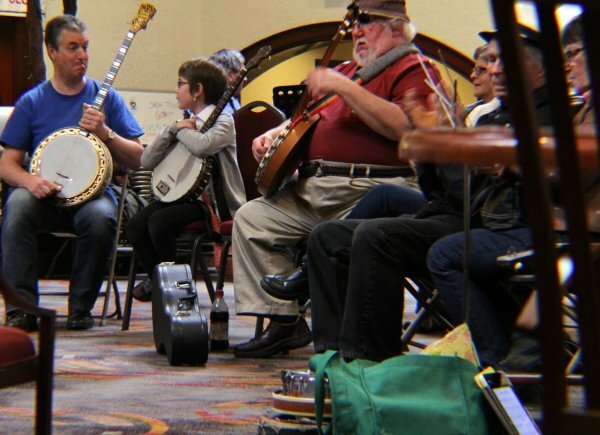 So that’s how I found myself at the North American International Banjo Convention, following my daughter around from workshop to concert to jam session. I know NOTHING about banjos. Zip, zero, nada. In fact being at this convention made me realise that the little I thought I knew is all mixed up and incorrect. 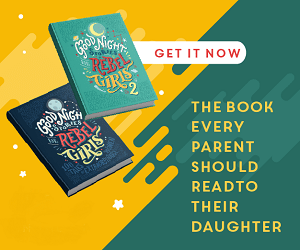 I sat on the sidelines as folks yammered on about longneck banjos, and tenor banjos, and ukulele banjos, and plectrum banjos, and different types of sheet music, and different picking styles, or strumming styles, or whatever. It all muddled together in my head into a giant puddle of “I have no idea what any of these people are talking about”. Apparently, if you dig banjo, this here is a killer line up. I also had no clue who anyone was. Certain people that were playing during the jam sessions, or taking the stage during the concerts, seemed to evoke an awed reverence from other attendees. To me, they were all just faces. Smiling, banjo playing, faces, who were patient and sweet with my daughter. I’m not going to lie, following her around and just sitting there while she played, or watched people play, it was downright boring for me at times. My daughter, however, was soaking it all in. Nodding, smiling, talking with fearless confidence to all these adult strangers. So for her sake, I muddled through. I figure anything that is so darn important to her, is important to me too. My daughter performed with her local group, and with the “All Girls” band. When she wasn’t up on stage, she sat next to me, transfixed, watching others play. I sat through three different concerts, sneaking sidelong glances at my girl. Her face alternated between intense concentration and glowing joy. “Wow Mom, that right there? That is how I want to play!”, she said as a particularly talented trio finished up their set. Another time, after they introduced a musician who is going to be inducted into the Banjo Hall of Fame later this year, she turned to me and said, “I’m going to be in the Banjo Hall of Fame one day.” I smiled and told her it was a good goal, and that if she wanted to get there it would take lots of practice. I later made a point of reminding her that these amazing musicians up on the stage didn’t just wake up one day knowing how to play the banjo. My girl will go days at a time without practising. Banjo is her thing. It’s not something I chose for her or pressed upon her. If she wants to be good she needs to practice. So, I remind her of that every few days, but I refuse to argue with her about it. I actually have a hard time wrapping my brain around the fact that she can be so enthusiastic and obsessed about something, yet so lackadaisical when it comes to practising. As we were walking around that convention, people treated my daughter like she was visiting royalty, or some kind of little rockstar. Pretty much everyone we walked by called out to her to congratulate her for playing on stage. One woman insisted she get her autograph. 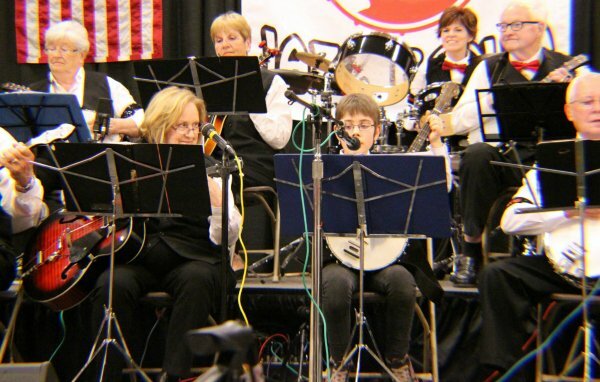 Another lady, who was one of the star performers from the Friday evening concert, made a point of coming up to Grace to ask her how she became interested in the banjo and to tell her that she herself started had playing when she was 8 years old. My daughter was the youngest person at the event, by several decades, and everyone we met was obviously excited to see “the next generation” there. One gentleman sat down next to my girl during a jam session and asked her to help him play this unfamiliar tune. 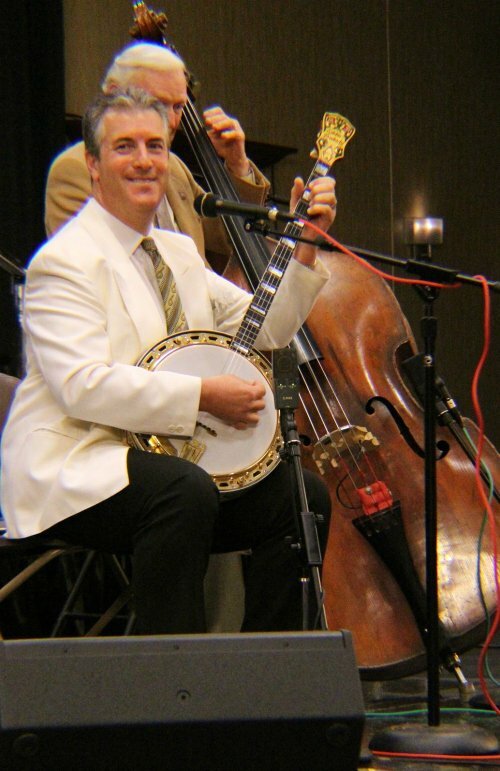 He turned out to be Sean Moyses, a banjo superstar who had flown in from London to take part in the convention. When he later took the stage, all dressed up in a white suit, my daughter didn’t recognise him as the fellow she had been jamming with earlier. Well, she didn’t recognise his face, however, she DID recognise his banjo. My mom and I had a good chuckle over that one. There were several people Gracie managed to recognise, not by their face but by their banjo. It’s obvious where all of her attention was focused, eh? Ohh, I think I recognise that banjo! Overall, I am so thankful to the people at that convention for being so kind to my daughter. For treating her like an aspiring musician, and not like a pint-sized nuisance. She had the most amazing, most inspiring, time, and she already can’t wait to go back and do it again next year. Me? Well, I guess I’ll be there again next year too, eh? I’ll just be following along, wherever my banjo girl takes me, doing that thing that we moms do, supporting our kids. I would love to know — Do your kids play a musical instrument? Do we have any banjo fans in the audience? 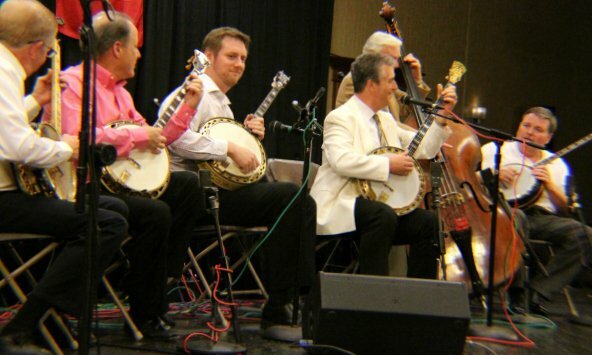 Do any of you play banjo, or know someone who does? I love this! 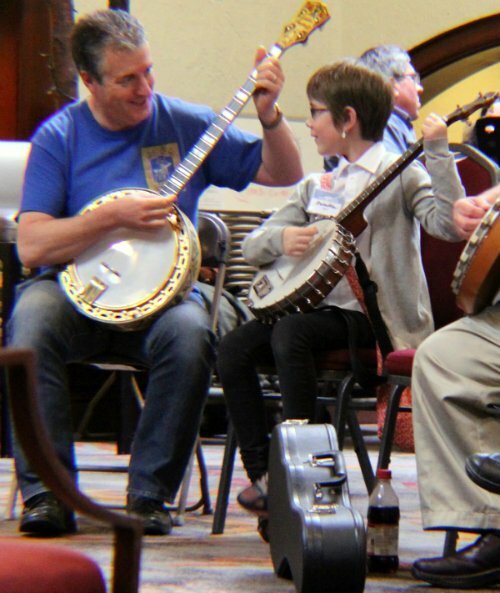 It’s not often you see youngsters wanting to play the banjo. Best of luck to her in her musical aspirations. I have two uncles who play the Banjo and I could sit and listen to them play for hours. Thanks, Terra. I always think it’s strange that she chose to focus on this instrument above all others, but I do love some of the music it makes. I am so not a musician, but my dad used to play the drums and I so loved watching him play.